A few weeks ago a story from Paris amused me. 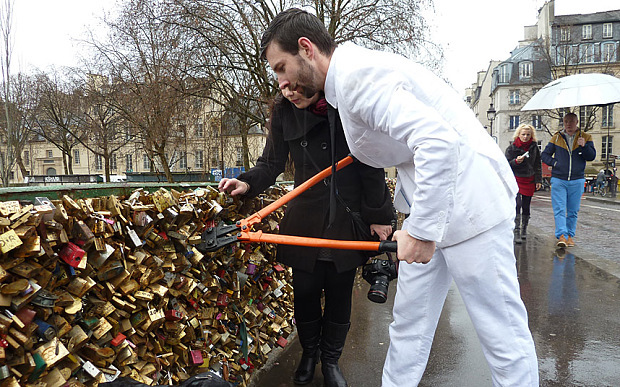 It seems Parisians are tired of lovers weighing down bridges in Paris with locks that symbolize their everlasting love. The Parisian bridges are not the only bridges around the world where couples “lock their love” together with a tangible manifestation, but they are probably the most famous. The locks are so numerous on one of the bridges that parts of the railings have fallen off from the weight of the locks. Recently, some Parisians have organized to attack the locks with bolt cutters in an attempt to “save the bridges”! The story piqued my interest as I fondly recalled the August my wife and I spent in Paris in 2013. Paris is everything everyone has ever said about it: charming and breathtaking and inspiring. But I will never forget the morning in Paris that my wife and I crossed the Quai des Tuileries. As I looked up and saw the thousands of locks attached to a bridge, I stopped in complete puzzlement. As a neophyte cosmopolitan I had never heard of the practice of couples attaching locks to a bridge railing to represent their undying love. After my wife explained the meaning of the multitudinous master locks, I doubled over with laughter. I couldn’t stop. As a teacher of world cultures, I am used to taking a detached view of the cultural norms and peculiarities of peoples from around the globe. In the process of introducing my students to the behaviors and beliefs of various cultures, they have recently discovered the foibles of child marriage, female genital mutilization, and “re-virginization” surgeries in the Middle East and Africa; the mania for investing in empty apartments in China, the plastic surgery obsession in Venezuela and South Korea, the wishful thinking of Europeans regarding the plans of Vladimir Putin in the Ukraine, and the destructive belief in religious purity in Pakistan. Not that the United States does not have its own self-destructive practices. We Americans waste millions of hours a year waiting in traffic. We remain fervently addicted to fossil fuels despite their extraneous costs. We idolize athletes and other entertainers while eschewing learning. We defend a drinking age of 21 regardless of its role in binge drinking and when “adults” ages 18-21 can defend their country, be legally liable for signing a contract, and be executed for certain crimes. And we stubbornly cling to the notion that the proliferation of firearms will make us safer in all contexts even as we wait expectantly for the next mass murder, domestic violence shooting, or child misusing an uzi. While these cultural practices and beliefs are more serious than my encounter with the “locks for love” on the bridges of Paris, the latter remind me that cultural idiosyncrasies are universal human adaptations. People from all corners of the globe have placed their faith in the symbolism of the locks; they are not the work of one ethnic group or nationality. And why do people use those locks? Do people really want to symbolize forceful attachment? Are emotions so fickle that they need a physical device to “bind” their partner? Do they have so little faith in their relationship that they require a padlock to fasten feelings mechanically. Of course the “lock lovers” believe that the locks are a sign of their devotion and intend to remain bound together. Whether all of those relationships remained as fast as the locks is beside the point. They represent all too human desire for permanence. After all, people are human too.